Tribune Publishing, the owner of The Los Angeles Times and The Chicago Tribune, will change its name to Tronc and rebrand as "a content curation and monetization company," it announced on Thursday. The rebrand, which is the brainchild of Chairman Michael Ferro, comes as Tribune continues to resist an aggressive acquisition bid by Gannett. Starting on June 20, Tronc, which stands for Tribune Online Content, will trade on the Nasdaq under the symbol TRNC. 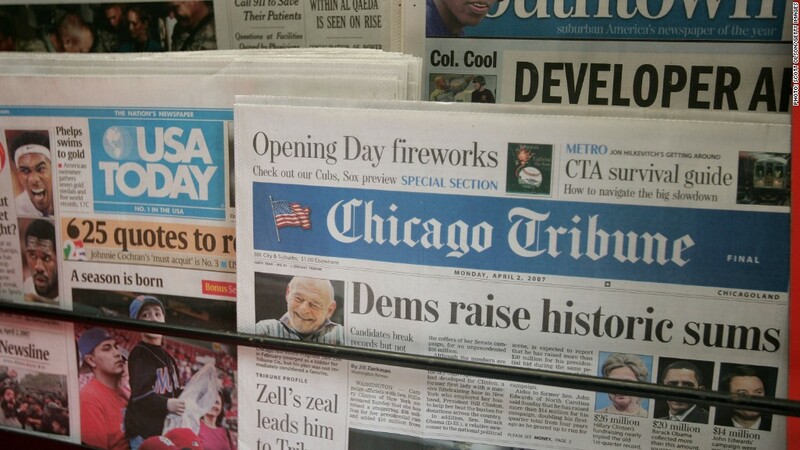 Tribune currently trades on the NYSE. Ferro's announcement, which was heavy on business-speak about monetization, content curation and user experience, seemed to leave many industry insiders baffled. He did not once mention the Times, the Tribune or any of the other newspapers that will provide Tronc with its content. "Our transformation strategy... is focused on leveraging artificial intelligence and machine learning to improve the user experience and better monetize our world-class content in order to deliver personalized content to our 60 million monthly users and drive value for all of our stakeholders," Ferro said. Ferro said the Tronc transformation had already brought in $114 million in growth capital. The announcement came on the same day that Tribune Publishing held its annual shareholder meeting, and just hours after Gannett announced that it was reviewing its offer to buy the company. Ferro, Tribune's largest shareholder, has resisted Gannett's offers even as they've gone up from $12.25-per-share to $15-per-share, representing a 99% premium on Tribune's $7.52 closing price in late April. Tribune shareholders elected all nominees to the board of directors on Thursday, though 49% of the shareholders withheld their vote in defiance of Ferro's opposition to the Gannett bid. Hours before the meeting, one shareholder sued Ferro and other board members for breach of fiduciary duty because of their refusal to accept Gannett's bid. A spokesperson for Gannett declined to comment on Tribune's Tronc announcement.